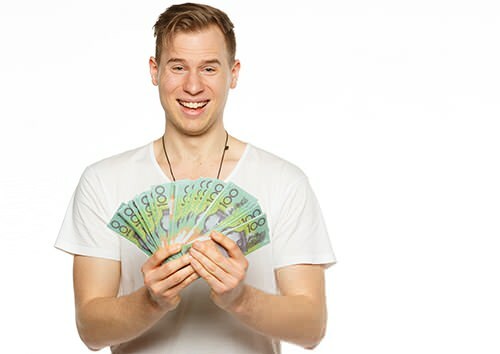 Alex Dusek holding some money which looks almost exactly like some of the money he won on ‘Million Dollar Minute’. When I left our chat with Alex last week, we’d just started discussing the experience of being in the studio for the actual recording sessions of Million Dollar Minute. I wanted to know a bit more about the nuts and bolts side of things; how the logistics of contestant-wrangling actually work on this show. So I asked him! SH: When you are in the studios, in the dressing rooms beforehand, do you mix with the other contestants? Are you all in the same dressing room? Is anyone trying to psyche anyone out? AD: There is a big holding room where everyone is, and then next to that is the green room where whoever the champ is resides. When you play an episode and then you win, they bring you back to the champ’s room and then immediately there are two new contestants there. At the time I was pretty friendly so I always came to chat to new opponents and kind of be quite congenial. Being more distant and less talkative I realized would be better, that being too friendly and upfront can be detrimental to performance. So I kind of started to do that, and I wouldn’t talk to opponents before the game unless they asked, and if they did I wouldn’t give much away. I was quite distant. It did improve my game, and how contestants mentally appraised me, I imagine. I was quite competitive about it and I was happy to talk afterwards, but before and during the game was a solo kind of exercise. SH: How much contact time did you have with your opponents before the game? Was it 15 minutes, was it an hour? AD: It was probably about 10 minutes. It is still a long time to be in a room with two people and not be doing much. SH: And “the elephant in the room”, of course. When you were on the show, how did you prepare yourself mentally if you had a number of questions wrong in a row? Did you have any mantras or self-talk that you’d tell yourself, to keep yourself on track? AD: To answer that I’d have to go back a week in time because the day that I went in and did my first recording wasn’t actually the first day I did an episode. Because I went in for a day where I didn’t get called up, and I stayed in the green room for the whole day playing Uno, watching TV and chatting generally, which was a lot of fun. At the end of that day, there was a woman who was a past champion of 1 vs. 100. She was a dairy farmer from Gippsland and she had all these theories on Hot Seat. She was very insightful as to how the game developed psychologically, and I remember thinking “she knows a lot more about this than I do”. I was just really itching to listen to it. At the end of the day when I was leaving, she said “if you get on next time, I think you’ll do well, when you’re there just remember that there is no one else in the room but you. It’s a three person game but you are there by yourself. (The show’s host) Simon is just trying to throw you a ball and all you have to do is catch that ball. If you drop it don’t worry about it, forget about it and just try and catch the next ball”. I kind of thought about that and that’s what I tried to do a week later. That was a good little mantra. During the games I made a point of not looking left – not looking at the opponents – and just focusing on the questions, focusing on myself and I just told myself that it was a fun game, just trying to do as well as I could. In addition to that, I was there for two days, a Monday and a Wednesday with a Tuesday in between. On the Tuesday I was set on an early night, but my mate Harry persuaded me a beach session was a good idea being 35 degrees, so we were down at Beaumaris beach and I was lying in the water there, it was really shallow, about 30 centimetres of water. I was lying on my back, looking at the stars. At that stage, I had won 5 episodes and had $80,000 guaranteed, so it was already a fantasy. I just remember looking up and feeling really peaceful, closing my eyes with my ears under the water level, and on the second day I tried to go back to that happy place of relaxation. That helped me a lot, so I’ve got Harry to thank for that. SH: The gap in between your first bunch of games and your second bunch of games was only one day? SH: It’s funny you should say about “catching the ball and catching the next one” because coincidentally one of my mantras when I was on Temptation if ever I got a question wrong, or if my opponents got it, I would just say to myself, in the back of mind “I know the next one, I know the next one.” It’s a really good way to stop getting Brain Freeze. Because you see time and again when people get it wrong and they go “Ah! Oh! I got that wrong! Ah! But anyway, anyway… back to it.” And by that time, the next question has been asked and answered. So that thing of just instantly kicking out any doubts and like you said; “Catch the next ball – it’s all for you”. You were consistently good in the Double Points Decider Round, when the real pressure was on. Why do you think that was? Was that all down to your training? AD: Thanks Stephen. That is so true, so often people let a wrong answer blow their concentration. I mean, no one wants to look silly on TV by mucking up something they think they ought to know, or would know ordinarily. The better players are like you say, the ones who can rebound quickly. I made plenty of mistakes. One question that springs to mind asked for the three golden words of real estate: where I should have said ‘location, location, location’ I said ‘sell, sell, sell’. Oh, and of course saying that Long Island isn’t in New York, that has to take the cake. It’s best to go in knowing that answering a lot of questions right, and fast, means some that are wrong, and silly. Double points? I think that comes down to different kinds of talent with questions. I am a strong visual learner, so if I hear a name or place or title I kind of quickly visualise anything associated with that word. If the question is more abstract, I think I tend to be less effective and so the game in itself with MDM is different because in the first few rounds the questions tend to be longer and wordier and they are kind of worded a little bit ambiguously so you are not sure of what the question is ultimately going to be asking for. Whereas in the Final Round, Simon has to ask questions that are very simple and short and brief. For me, the simpler the questions are, the better I tend to do. So that was a round where he would talk about a trigger like a reference thing. So it might be like “The movie Gladiator…” and then you think of Russell Crowe and the mental space between the trigger and the answer is quite short. I think that is why I tended to do better. If you look at my earlier rounds, often I answer a lot of questions but they kind of level out; like I get five right and five wrong. I don’t really get anywhere. To me the episode hinged entirely on that final 60 seconds. The first three rounds were just the opening acts that made good theatre. SH: It’s interesting that you paid that much attention to the questions and the structure of them and analysed them that much, because 9 times out of 10, the contestants seem to go “Ah well, what can you do? It’s all just a bit of fun; how can you study for this?” But you can! You can study the show and how it is structured and put together. And everyone has that information available to them by watching the show and consuming it carefully. AD: That is exactly right. How do people have that view you just talked about, when clearly you can do that little bit of work? This entry was posted in Brain Training, Game Show Winners, Interviews, Managing Stress, Strategy, Tactics, Updates by Stephen. Bookmark the permalink.